A memoir of brutality, heroism and personal discovery from Europe's dark heart, revealing one of the most extraordinary untold stories of the Second World War In the spring of 1945, at Rechnitz on the Austrian-Hungarian border, not far from the front lines of the advancing Red Army, Countess Margit Batthyany gave a party in her mansion. The war was almost over, and the German aristocrats and SS officers dancing and drinking knew it was lost. Late that night, they walked down to the village, where 180 enslaved Jewish labourers waited, made them strip naked, and shot them all, before returning to the bright lights of the party. It remained a secret for decades, until Sacha Batthyany, who remembered his great-aunt Margit only vaguely from his childhood as a stern, distant woman, began to ask questions about it. 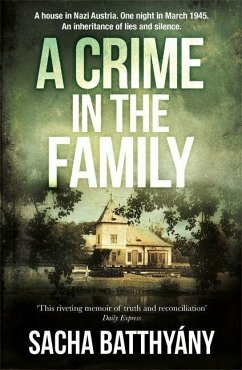 A Crime in the Family is Sacha Batthyany's memoir of confronting these questions, and of the answers he found. It is one of the last untold stories of Europe's nightmare century,spanning not just the massacre at Rechnitz, the inhumanity of Auschwitz, the chaos of wartime Budapest and the brutalities of Soviet occupation and Stalin's gulags, but also the silent crimes of complicity and cover-up, and the damaged generations they leave behind. Told partly through the surviving journals of others from the author's family and the vanished world of Rechnitz, A Crime in the Family is a moving and revelatory memoir in the vein of The Hare with the Amber Eyes and The House by the Lake. It uncovers barbarity and tragedy but also a measure of peace and reconciliation. Ultimately,Batthyany discovers that although his inheritance might be that of monsters, he does not bear it alone. Sacha Batthyány was born in Switzerland in 1973 to Hungarian émigré parents. He was an editor at the Neue Zürcher Zeitung and is now a political reporter for the Süddeutsche Zeitung, based in Washington DC.